The basic contrast and coloring are defined by the combination of [Gamma] (gamma curve) and [Color Mode] (color characteristics) settings. Gamma curve that obtains a dynamic range of 460% when the exposure is adjusted to 33% video output with 18% reflectance gray. The maximum value of video output is 109%. Images shot with this gamma can be used without grading, but since the images have smooth gradation characteristics, this can be used to grade and finalize the viewed image in the post-production process. Gamma curve that obtains a dynamic range of 460% when the exposure is adjusted to 30% video output with 18% reflectance gray. The maximum value of video output is 100%. S-Log2 [S-Log2] gamma curve. This setting is selected when some grading work will be performed after recording. 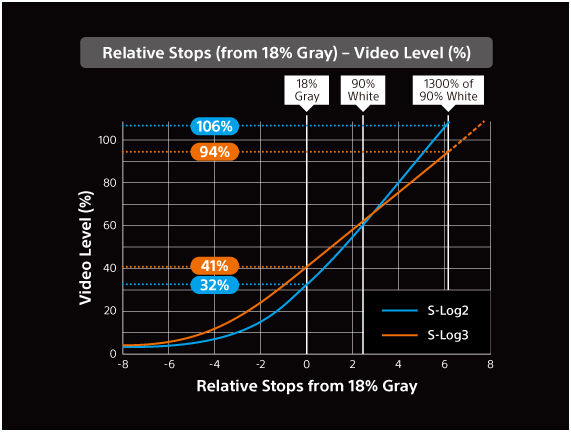 The exposure is set so that 18% reflectance gray video is output as 32%. Under these conditions, a dynamic range of 1,300% is obtained with 90% reflectance white. The maximum value of video output is 106%. S-Log3 [S-Log3] gamma curve with characteristics closer to those of film. This setting is selected when some grading work will be performed after recording. It allows for better reproduction of gradations in shadows and the mid-tone range than S-Log2. The exposure is set so that 18% reflectance gray video is output as 41%. Under these conditions, a dynamic range of 1,300% is obtained with 90% reflectance white. As a characteristics of S-Log3, the dynamic range can be extended above 1,300%. However, Picture Profile is set to a dynamic range of 1,300% in order to maintain a balance with camera performance. Under these conditions, the maximum value of video output is 94%. 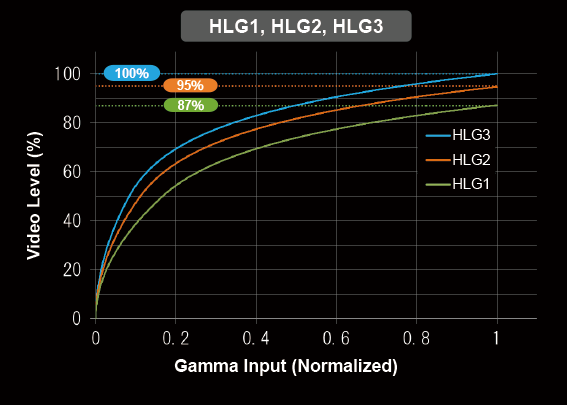 HLG HDR gamma curve. Characteristics correspond to the ITU-R BT.2100 HDR standard. HLG1 HDR gamma curve. Reduces noise more than [HLG2]. However, shooting is restricted to a narrower dynamic range. Maximum video output level: 87%. HLG2 HDR gamma curve. Provides a balance of dynamic range and noise reduction. Maximum video output level: 95%. HLG3 HDR gamma curve. Wider dynamic range than [HLG2]. However, noise will be higher. Same dynamic range as [HLG]. Maximum video output level: 100%. With HLG 1–3, movies will not look unnatural compared to conventional SDR movies, but you can take advantage of the wider dynamic range for more expressive movies. They all offer a gamma curve with the same characteristics, but each strikes a different balance between dynamic range and noise reduction. S-Gamut Setting based on the assumption that some grading work will be performed after recording. Used when [Gamma] is set to [S-Log2]. S-Gamut3.Cine Setting based on the assumption that some grading work will be performed after recording. Used when [Gamma] is set to [S-Log3]. This setting is easier to use than [S-Gamut3], because it limits the gamut to a more practical range than that of [S-Gamut3]. It is recommended in cases where [S-Gamut3], a wide gamut, is not required. S-Gammut3 Setting based on the assumption that some grading work will be performed after recording. Used when [Gamma] is set to [S-Log3]. This setting has a wider gamut than that of [S-Gamut3.Cine]. It is suited for converting images to a format with a wide gamut like BT.2020. Depending on the type of camera, the entire [S-Gamut3] gamut may not be supported. BT.2020 HDR color mode. Standard color tones when [Gamma] is set to any HLG option. Corresponds to the gamut defined in the HDR standard ITU-R BT.2100. Only available when you select the gamma curves mentioned above. Color bar output may be inaccurate when [BT.2020] is selected, depending on camera specifications. 709 HDR color mode. Color tones for recording in HDTV format (BT.709) when [Gamma] is set to any HLG option. Only available when you select the gamma curves mentioned above.